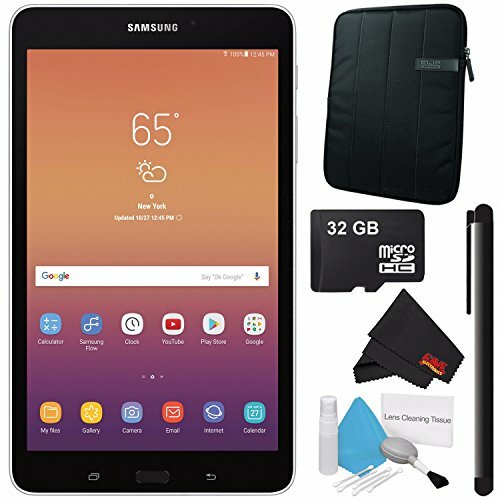 Samsung 8.0'' Galaxy Tab A 8.0 32GB Tablet (Wi-Fi Only, Silver) SM-T380NZSEXAR + Universal Stylus for Tablets + Tablet Neoprene Sleeve 10.1'' Case (Black) + 32GB Class 10 Micro SD Memory Card Bundle by Samsung at The GM Sign In. MPN: SM-T380NZSEXAR-2. Hurry! Limited time offer. Offer valid only while supplies last. The silver 2017 8.0'' Galaxy Tab A 8.0 32GB Tablet from Samsung delivers powerful performance and wireless content sharing in a sleek, modern design. The silver 2017 8.0" Galaxy Tab A 8.0 32GB Tablet from Samsung delivers powerful performance and wireless content sharing in a sleek, modern design. This tablet is powered by a quad-core 1.4 GHz Snapdragon 425 processor and has 2GB of RAM. It comes equipped with 32GB of built-in storage, expandable via the microSD card slot. For high-speed Internet connectivity, Wi-Fi is built-in. Bluetooth 4.2 connectivity is also integrated for wireless pairing with compatible devices, such as headphones and other Bluetooth-enabled accessories.